Are Wellbeing and Happiness the same? Do you often refer to your ‘wellbeing’ or ‘happiness’ when describing your current mental state? What about when you talk about ‘being happy’ – is this the same as ‘being well’? Wellbeing and happiness are two terms often used interchangeably in the news and on social media, so it is important that we distinguish the two concepts from one another. Being ‘happy’ or ‘happiness’ is a transient or momentary state that describes your emotional (or psychological) frame of mind at that moment in time, which can change rapidly depending on your situation or circumstances. In contrast, ‘wellbeing’ describes a more comprehensive and stable view of your current mental state, and is comprised of multiple factors that each contribute to your overall health and functioning. 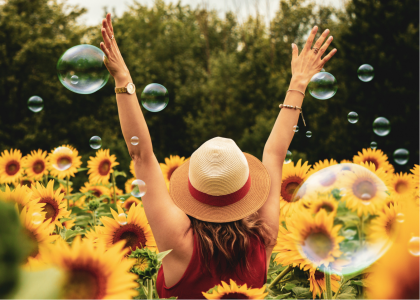 This means that happiness, while being crucial, only forms a part of your wellbeing – it can contribute to your life satisfaction but is not sufficient on its own to help you flourish. So, what is wellbeing composed of? There are two main types of wellbeing. This consists of your positive and negative emotions (including happiness) as well as how satisfied you are with your life. This consists of things such as your own-worth, your levels of self-confidence and autonomy, and your perceived level of mastery over your environment. So, the next time you read an article that promises to make you ‘happy’, ask yourself whether it would also increase your overall wellbeing and help you live the best life you can.